BotQueue v0.3 = Webcams, Pausing, and More! Update: there were a couple bugs with the client. I’ve released a new version you can download here. Coming quickly on the heels of the last release, the latest v0.3 release of BotQueue adds some really exciting new features that make it much nicer to use. I hope you enjoy this new version as much as I do. Be careful though, the new webcam feature is addictive – you can watch your machine from anywhere you have an internet connection and a display. If you want to take advantages of the new BotQueue, you’ll need to upgrade the BotQueue client, bumblebee. See instructions at the end of the article for how to do that. This is the biggest new feature for BotQueue, and the one that I’m most excited about. The BotQueue client, Bumblebee, can now grab webcam images and upload them to the BotQueue site. This allows you to be able to see whats happening on your bot through the BotQueue.com website. That’s right, you can see how your bot is printing from any device (computer, phone, tablet, etc) from anywhere in the world. I’ve also modified the dashboard and various pages throughout the website to support showing the webcams. The default dashboard view is now large thumbnail images, although you can switch to medium, small, and the old list-style view of your bots. BotQueue will also save the final image of each job so you can have a historical view of how each print turned out. In the future, we’ll even be able to automatically create timelapse videos of each job. In order to add webcam support, please see the help page with information on how to configure bumblebee to start capturing and uploading webcam images. It happens fairly rarely, but sometimes you need to pause a job mid-print to do something. Maybe a nut fell into your print, or maybe you need to reach your hand in to clear out some debris. Well now you can pause and unpause a job from the BotQueue.com website. Due to the magic of the internet, the request will filter down to your bot whether you are in the same room or on the other side of the planet. Due to the way this is currently done (polling HTTP requests) the lag is pretty bad (~30 seconds). Future versions of BotQueue will be implementing Websockets and should be MUCH faster. I’m a huge fan of stats, and once you have stats you can start doing what every primate has done ever – compare him/herself to others! Well, the BotQueue stats page now has a leaderboard for both bots and users. How does your bot stack up? 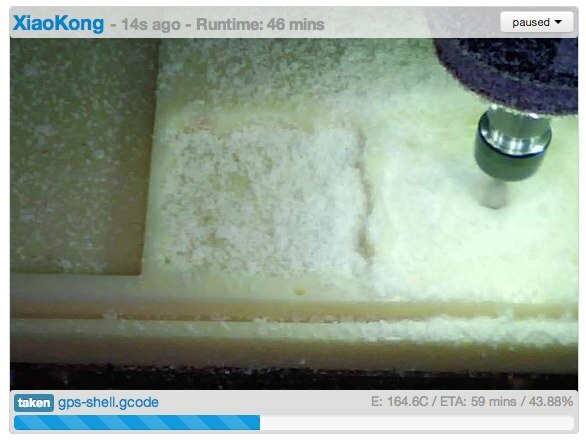 Are you logging the most hour and producing tons of stuff with your machines? Head on over to the stats page and see how you stack up! This is a pretty straightforward feature that allows you to make a comment on any job. Use it for making notes on output quality, or just helping you keep track of what is what. If you add a comment, the job detail page will show a badge next to the comments tab to let you know that there are comments when looking at the job. Since BotQueue v0.3 adds webcam support, and this requires some new software to make it all happen. For Linux, we’ll need to install fswebcam. If you’re on OSX, you don’t need to do anything – the webcam support is bundled in the new version of bumblebee directly. You’ll also need the new version of bumblebee which can be downloaded here. Simply unzip the folder and run the bumblebee program like normal. You will need to copy your config.json file over and modify it with your webcam information as described in the help area. 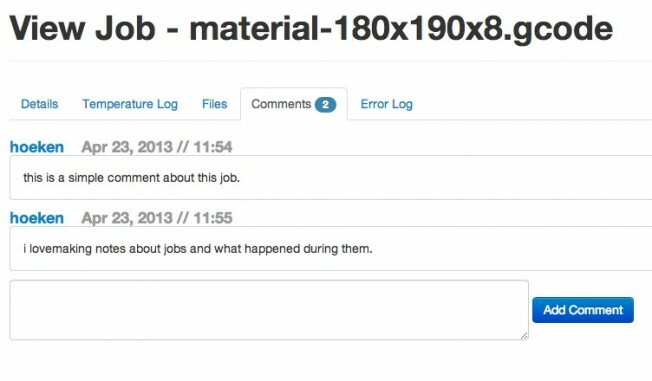 * WEB – add organization to job view page – tabs? * WEB – create script to populate job_clock with times from existing jobs. * WEB – create job_clock entry on start of job. * WEB – added leaderboard to stats page. * WEB – add source info for jobs added by url. * WEB – added webcam display to dashboard, bot, and job. * WEB – add ajax checkbox for turning on/off auto-update. * BUMBLEBEE – allow pausing and unpausing based on api status change. April 24, 2013 Zach Hoeken BotQueue Comments Off on BotQueue v0.3 = Webcams, Pausing, and More! © 2012 Zach Smith, Hoektronics LLC.